Continue on to watch an archived version of the livestream. - Pitch speeds will not be adjusted universally as "most people do not hit very well." - Higher difficulties within Seasons may see faster pitch speeds. Will be investigated by the team. - Souvenirs & Exchanges: Some improvements made to help make some of them easier to achieve. - PCI: Team is constantly evaluating and investigating potential issues. - 30 free flashbacks or legends available, one per team. - Hass takes a look at the Team Epics rewards screen and missions, including a detailed look at Baltimore. 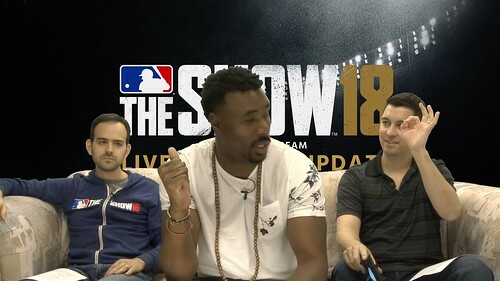 - Hass then takes a look at the rewards for Detroit, Seattle, Chicago Cubs, San Francisco, St. Louis, Toronto, Cleveland, Atlanta, NY Mets, Cincinnati, Milwaukee, Colorado, & Minnesota. -A new mission in every Immortal in exchange for Team Epic programs. - Southpaws event. 2014 Jon Lester Flashback is reward. Lasts until April 23. Three-inning games featuring left-handed batters and pitchers. - Thresholds lowered based upon feedback and telemetry. - Rookie version of Vlad Guerrero shown/added (Level 50). - Upcoming events for Jackie Robinson Day and April Timed Events shown. - Discussion of last week's roster update. - More programs coming in upcoming weeks and months.